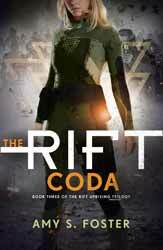 The Rift Coda: Book Three of the Rift Uprising Trilogy (2018. 353 pages) is the third and final book in this young adult science fiction series. The series was written by Amy S. Foster. Whilst it is laudable and, let’s face it, pretty mainstream to have a strong, female, central character, the danger is that she will turn out to be another Katniss Everdeen. Ryn is not a million miles away from having this problem. She is a great fighter who reluctantly has to become a leader in the fight against their oppressors. Foster folds into the narrative a bit of a love triangle to keep things hormonal and provides Ryn with allies to help her fight back. The book posits that the multiverse exists and that various Earths can be reached via the titular Rifts. While not a wholly original idea, it does offer up to the author almost limitless possibilities in constructing alternative civilisations and histories. The book doesn’t really make the most of the idea. We are re-introduced to new angelic races and the Roones, the big bad of the series. You would think that the last book, with its inevitable final confrontation would be quite pacey, but it is not. A lot of the first third of the novel involves meetings and more meetings. It’s not that the book wasn’t well written for a young adult novel, it’s the lack of originality which mostly hurts the story, leaving it neither great science fiction nor differentiated enough from the competition to really stand out.